For me, one of the best bits about heading off on my holidays is the chance to spot all the brand new local flora and fauna. I love checking out colourful lizards, armoured beetles, beautiful birds and especially majestic tropical plants. It’s a lovely reminder of time spent away to bring tropical houseplants into the home. Houseplants have loads of benefits aside from looking marvellous – read all about those in my blog here. In this article, I’ll sum up my top five tropical houseplants in terms of all-important looks, and ease of care. 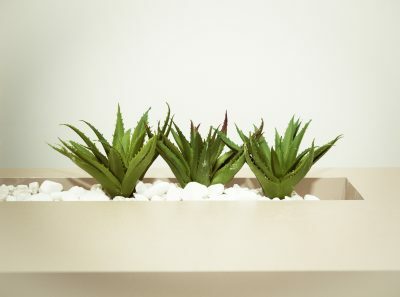 The pointy, spiky, stripy leaves of aloe vera plants just scream Mediterranean summer to me – but these versatile guys actually hail from the Africa and the Arabian peninsula. They’re extremely easy to grow and propagate indoors, and will often sprout babies with very little prompting. Their soft, fleshy leaves can be used for all sorts of purposes including skincare (the translucent jelly within is said to treat everything from ageing to sunburn! ), and cookery. Water about every three weeks to discourage rot, less frequently in winter, and place in bright but indirect sunlight to encourage lots of strong growth. 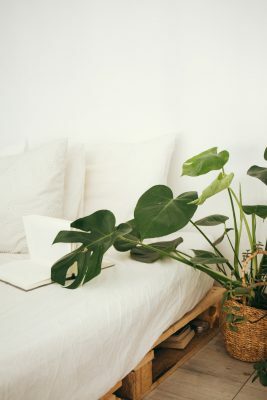 Otherwise known as cheese plants, lovely Monstera are having a real moment right now. This Mexican native has large, split leaves that earned its name as they look like slices of Swiss cheese! With a bit of maintenance and care, Monstera can live for years and become large, structural focal points for any type or design of room. Water whenever the top soil feels dry to the touch, and mist its glossy leaves with water regularly to keep them looking their best. If your plant starts to grow big and leggy, provide it with a moss-covered support that its aerial roots can grip onto and climb up. Dieffenbachia is commonly known as ‘dumb cane’, but there’s nothing dumb about these regal beauties. There are dwarf varieties on the market that are great for smaller surfaces, and variants like Tropic Snow can grow up to five feet tall with very little intervention, even in a smaller pot. This plant has large, blowsy, green and yellow smudged leaves that may cause the plant to become top heavy though, so watch out for this. It’s important to note that these plants will cause a really nasty reaction if ingested, so perhaps not an ideal choice for homes shared with animals or little ones. 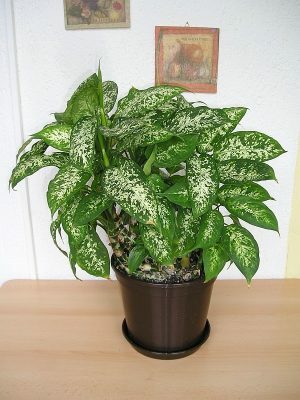 Read my full article on toxic houseplants here. The quill-like, brightly coloured blooms of the bromeliad are their main draw for me, as well as their structural foliage. Pineapples are a member of this family, so the name of the game is strong, spiked leaves and a resilient temperament. They remind me of times travelling in the tropical jungles of South and Central America, so I love to welcome them into my home too. They’re really low-maintenance, with only occasional watering and misting required (they are used to tropical humidity after all). 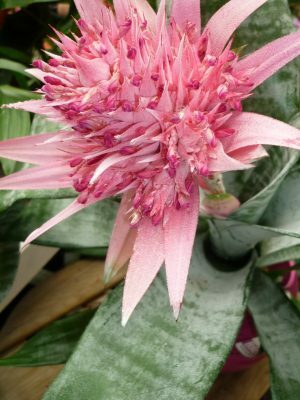 My favourite is Aechmea fasciata for its stripy leaves and fuchsia-pink blooms. Cats love to chew on their leaves for some reason, but the good news is that these beauties are non-toxic, so the whole family can enjoy them! I love the look of fluffy, draped Boston ferns in the home, particularly in a hanging macramé basket. They’re also really reminiscent of the tropical forests they hail from. Boston ferns can be tricky to get going as they’re a bit delicate, but once they’re established they’ll happily thrive with a bit of regular misting. They love a humid environment, so are perfect for a bathroom shelf away from direct sunlight.